There will be much written in the coming days about the opening of One Eleven at the Capital, the new restaurant within the venerable Capital Hotel in downtown Little Rock. The establishment will open its doors to the public the evening of Friday the 8th of August, 2014... another landmark for a location with ties back to Arkansas's earliest restaurants. 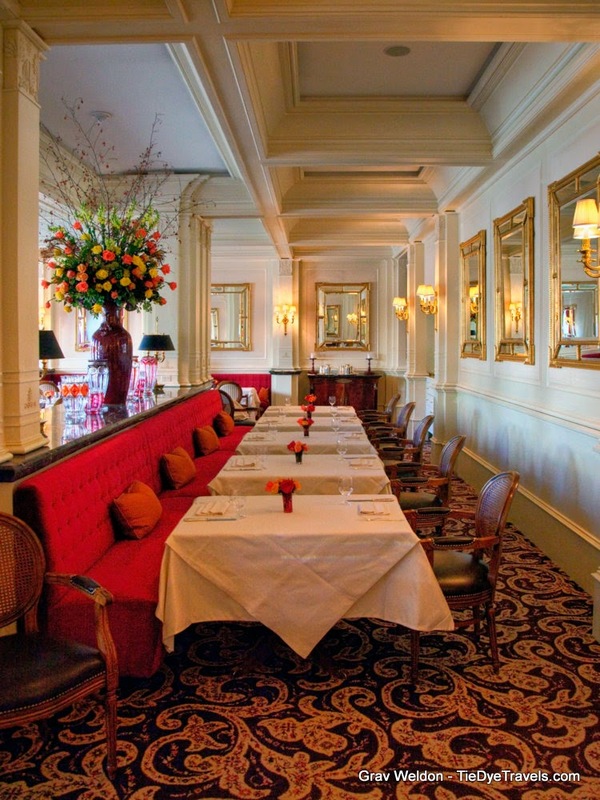 Much will be said for the passing of Ashley's at the Capital, the longstanding formal dining experience that saw one rebirth after another, most notably with the reopening of the restaurant and hotel in 2007 under the guidance of Chef Lee Richardson. For those who are wondering, after an evening with fellow food writers and photographers hosted by One Eleven at the Capital, Richardson's lingering presence has finally been excised from the eatery, and the remarkable French chef Joël Antunes can assuredly step into the pantheon of Little Rock's celebrated cheftorium of excellence. Photographer Grav Weldon accompanied me, but his assignments have taken him elsewhere, so I offer to you at this juncture a chance to step inside the new restaurant and view the changes that first meet the eye, along with a sampling of the many dishes Chef Antunes shall offer. Dinner service begins the 8th, with breakfast to follow on the 9th, lunch on the 13th and finally Sunday brunch on the 17th. closet and a portion of the kitchen's washroom. with dividing half-wall and mirrors. Note the lush carpeting. cleaner atmosphere. Note the removal of the half wall. back behind the kitchen wall. the rounds for entertaining larger parties remain. straws and lavash are baked fresh throughout the day. famed Capital Hotel soda cracker. The hummus will be served as tapas during evening meals. small plates offered with dinner selections. This fine morsel was served on a small pile of chopped cucumbers with dill. Simple yet rich, small yet elegant, a fine caponata. Grav even had to pose. organic beetroot salad with burrata cheese. I don't like beets, but I'd eat this. A fine Eggplant Baba Ganoush with Lavash. believe they'll be served in larger portions!). is presented with sundried tomatoes and gnocchi, and it was marvelous. robust and delightful with the powerful punch of the coleslaw bed below. The one dish I could not sample was this Berkshire pork cheek with pasta. made there... which include far more counter space for plating. for more sous to produce dishes at a time. I never thought I'd be excited by the mere sight of cream before. for service at One Eleven. of the new brand celebrated at One Eleven. of the evening, with bits of caramel coated popcorn and a tiny muffin included. with Vanilla Chantilly Cream is a masterpiece. It was so marvelous, I had to shoot it twice. ice cream... I'm hoping they'll be offered at the bar in the morning with hot, fresh coffee. Of course, there will be a lot of talk about the changeover. I've had a chance to check out the menus and am excited, though I lament the demise of my favorite breakfast, the Delta Sunrise with its housemade corned beef hash. But steak and eggs will be a breakfast option now. Of course I will give it a try. You will find out lots in the coming weeks on One Eleven at the Capital through its Facebook page. Be sure to share your comments. Everything sounds delish! I really can't wait to try it out. Looks absolutely divine. Really loved the post and will plan to go next time we are in Little Rock. The pictures and descriptions have left me with quite an appetite! I can't wait to experience One Eleven at the Capital for myself! !